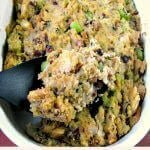 Made with a mixture of crumbled cornbread and day-old white bread with toasted chopped pecans and walnuts, this Cornbread Pecan Walnut Stuffing is perfect for Thanksgiving! I’ve been hosting holiday dinners for many years, since long before I knew how to cook like I do now. I can remember my mother asking me if I remembered to remove the packet with the giblets and liver from the turkey before I cooked it. Yes, I did. 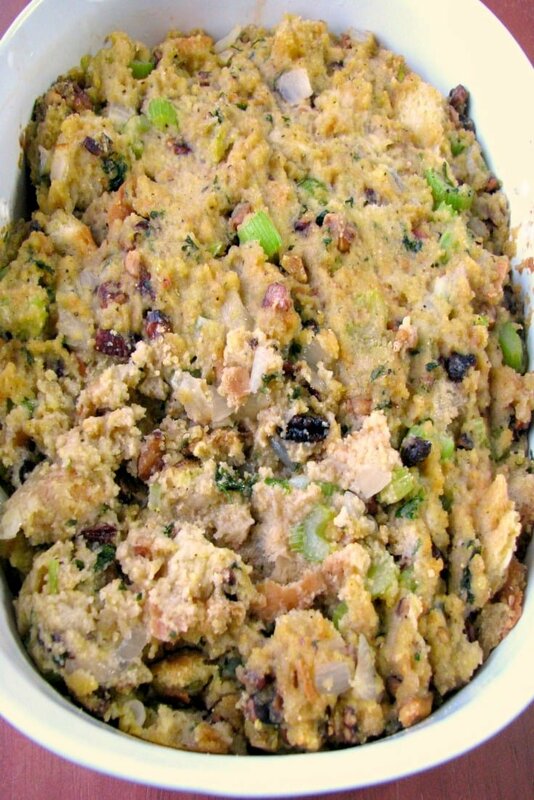 Cornbread Pecan Walnut Stuffing was the first stuffing I ever made from scratch. 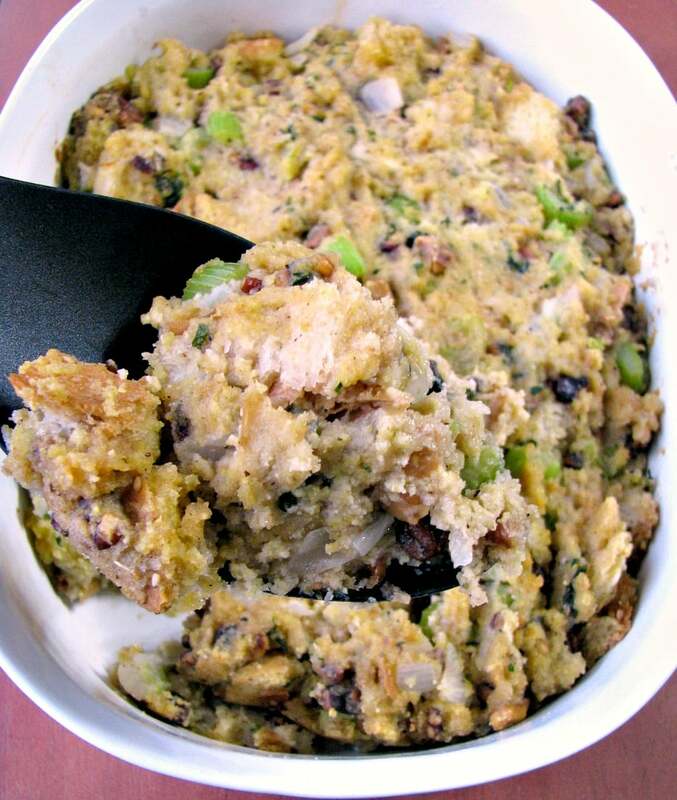 Technically, it’s cornbread-pecan stuffing from The Family Circle Cookbook New Tastes for New Times. I followed the recipe exactly for years, minus the fact that the original recipe called for it to be in a stuffed turkey breast since I prefer not to stuff my turkey, and just recently changed it to suit my tastes. The addition of walnuts came simply because I didn’t have enough pecans one time, and I changed the broth used from chicken to turkey stock and increased the amount used. 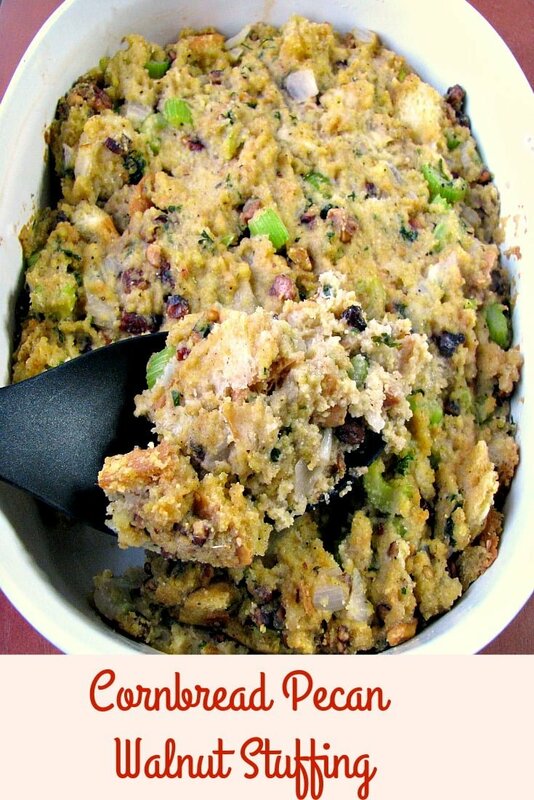 I use store bought cornbread mix that I bake and crumble right before making the stuffing. One thing to keep in mind is cornbread can vary in the amount of sugar, and if you use a sweet one the stuffing will be sweeter. That is completely your choice. I used Jiffy brand cornbread mix many times. You could also just purchase a bakery cornbread. If you don’t want nuts in your stuffing, or you need to save room in your oven, try Slow Cooker Stuffing with Bacon, Onions, and Sage instead. Serve either with Slow Cooker Turkey Breast With Gravy or Perfect Roast Chicken (or Turkey). 1 cup turkey stock (or chicken broth/stock) , plus up to 1/4 cup more if desired for moister stuffing. Melt the butter in a large skillet over medium heat. Add the chopped celery, onion, and parsley; cook for about 10 minutes, stirring often, until softened. Stir in the poultry seasoning, salt, and black pepper. Remove from the heat and set aside. Combine the white bread cubes, cornbread, turkey stock, milk, and egg in a large mixing bowl. Toast the pecans and walnuts for a minute or two in a toaster oven or regular oven, stir, toast for another minute or two, watching closely so they don't burn. Stir in the onion mixture, pecans, and walnuts into the bread mixture. Add additional stock if the stuffing seems too dry. Preheat the oven to 375 degrees F. Spoon the stuffing into a casserole dish; cover with aluminum foil. Bake in the preheated oven for 30 minutes. Remove the foil and continue to bake for 10 more minutes.